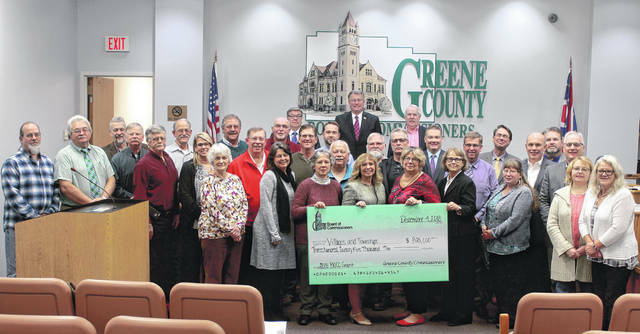 Anna Bolton | Greene County News Greene County Commissioners Bob Glaser, Tom Koogler and Alan Anderson present checks to village and township officials Dec. 4 as part of a new Department of Development grant program. XENIA — Greene County commissioners handed out checks totaling $325,000 to the county’s villages and townships Dec. 4. The board voted in October to create a grant fund through the Greene County Department of Development and disperse $500,000 to the county’s cities, villages, and townships. Beavercreek, Bellbrook, Fairborn, and Xenia will share $175,000 while the villages and townships will share $325,000. Commissioner Alan Anderson explained that the amount of money given to each political subdivision was calculated on a per capita basis. The grant money was made available from a combination of cutting costs in the county and the revenue received from sales tax, according to Commissioner Bob Glaser. Commissioner Tom Koogler talked about a $26 million cash carryover, and the decision to share it with the community. “Having that money in the bank doesn’t do the county or the community any good. We have to get it working in the community, and what better way of doing that than by giving it back to the local political subdivisions? They know what they need more than what we do,” Koogler said. The entities will choose how to spend their funds; the only restriction is that they must be used toward permanent public improvements. Some officials stepped up to share their current projects and ideas of how they might use the funds in the future. Brian Housh, Yellow Springs’ council president, mentioned the village’s infrastructure plan and possible paid parking, and added that the village would leverage the funds by seeking other grants. “It’s important to us that we work together and I think that’s one of the great things about Greene County. I see a lot of positive things moving forward,” Housh said. Alex Bieri, Clifton’s mayor, talked about the village’s zoning work, revamping nuisance ordinances and reinvesting into public facilities. Carolyn Destefani, Sugarcreek Township trustee, said some of the funds might be used toward building a monument to the military. Each entity will submit a report to the director of development by Oct. 31, 2019 explaining how the money was spent. https://www.xeniagazette.com/wp-content/uploads/sites/32/2018/12/web1_Comms-1.jpgAnna Bolton | Greene County News Greene County Commissioners Bob Glaser, Tom Koogler and Alan Anderson present checks to village and township officials Dec. 4 as part of a new Department of Development grant program.